Former band mates post pic of reunion with 'Dr. Feelgood' producer Bob Rock. 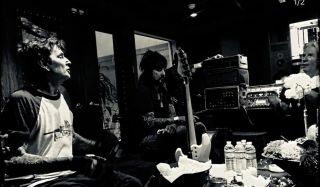 Yesterday, former Mötley Crüe bassist Nikki Sixx sat down with Steve Vai to talk riffs, gear, Led Zeppelin and Frank Zappa on his show, My Favorite Riff with Nikki Sixx. Nikki Sixx Discusses Mötley Crüe's Future and Past, When "Debauchery was King — and We Embraced It"